With the ever increasing number of online music streaming services available via the web and dedicated mobile and tablet apps, it becomes quite tough to choose the perfect online music streaming service that suits your needs. There are many free music downloading sites which let you download free mp3 music worldwide. If you are looking to discover new songs, it’s a smarter idea to listen to them first by streaming them online before downloading. Using the best music streaming apps on your smartphone, you may stream music and decide which new song is good enough to download and which is not worth downloading. We are definitely in the new era of internet, and the new generation has got much smarter at least in this aspect. There are many best free music downloader apps for Android, but today, I’m sharing Best Music Streaming Apps for Android & iOS Power Users. Most of these music streaming apps are free [with ads] and allow you to stream music online and even download them to play in offline mode. However, if you wish, you can get a premium subscription and go advertisements free. So there come online music streaming services into play with some innovation. So let’s see these best music streaming apps. Let me start with my favorite music streaming app – Gaana. Gaana is one of the most popular music streaming apps in India. It is the best place to listen to songs in various Indian Languages like Hindi, English, Bengali, Oriya, Bhojpuri, Tamil, Telugu, Kannada, Malayalam, Punjabi, Marathi, etc. The user interface is straightforward and is very easy to use. You can set your preferred language and stream music of your choice. Also, you can save them to your device to listen later. Creating a playlist and managing music is very simple. The songs are streamed at 128 Kbps by default, however, you can adjust it yourself. It offers approximately same features across both Android and iOS platforms. Also, you can buy its premium subscription Gaana+ that lets you download unlimited songs. But what do I like most about this app is its built-in radio “One Touch Radio” feature that allows you tune into your favorite radio station based on the songs or artists you like. Download Gaana: Android, iOS, Windows Phone,. Now let’s talk about one of the first streaming music services in the world. 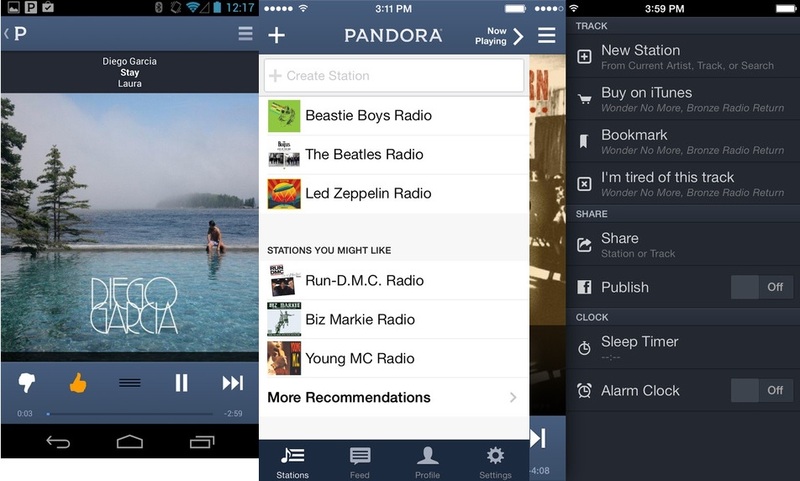 Pandora is a top-rated and best music streaming app that you can not only use on your mobile devices but also on your computer. It also works on some selected set top boxes like the Roku Player. Using Pandora, you can stream music online, save tracks, create your playlists and provide thumbs up or down feedback. The more feedback you’ll provide, the better streaming personalized experience you’ll have. Though Pandora is available for free [with ads], you’ll get limited features and some restrictions like the number of tracks you can skip per hour, etc. which you can remove by upgrading it to Pandora One. The only thing that disappoints me about Pandora is that it’s not available in countries other than US, Australia, and New Zealand. But despite that, undoubtedly Pandora is one of the best music streaming app. Download Pandora: Android, iOS, Windows Phone. Let me add another popular Indian name in the list of best music streaming apps. Saavn is one of those apps which are designed to be best for Indian music. You can stream and listen in various Indian languages like Hindi, English, Punjabi, Marathi, Tamil, Telugu, Bengali, Malayalam, Kannada, Gujarati, Bhojpuri, etc. You’ll have a better user experience while using Saavn on iOS, as compared to that on Android platform, yet the app includes numerous important features. Like Gaana, Saavn also lets you download the music for free for offline listening, but that is limited only for first 14 days. After these 14-days period, you are required to upgrade to premium if you wish to have unlimited download allowance. The automatic sync feature across various devices is a handy feature of this best music streaming app and a factor why you may prefer Saavn over Gaana as this feature is not available in Gaana app. 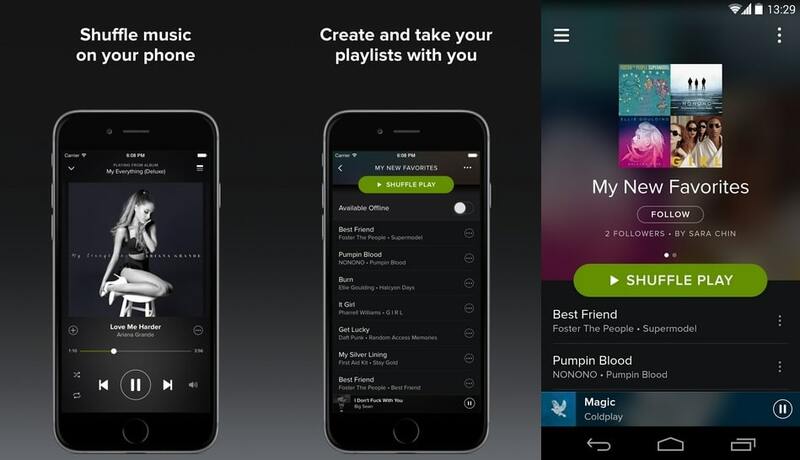 Spotify is yet another popular and best music streaming app which you can enjoy on your multi-devices like mobile, tablets and computers. You can stream online music and discover new songs for free with its discover mode. Though to download songs for offline playing, you are required to buy premium subscription feature which also lets you go advertisements free. Though Spotify music streaming app is mainly popular in the US and Europe, it has a huge collection of songs-tracks, artists, and albums. That is why I recommend Spotify as one of the best music streaming app that is worth checking. Download Spotify: Android, iOS, Windows. Hungama is another best music streaming app with made-in-India tag which is very popular among Indian users. While using Hungama music app, you have access to an unlimited huge number of Bollywood songs and videos. You can easily change your mood with changing the genre to Pop, Rock, Bhangra, Devotional, Romantic, Love songs. Also, you can enjoy music in various regional languages like Marathi, Bengali, Punjabi, Bhojpuri, Kannada, Tamil, Telugu, Malayalam, Gujarati & other South Indian languages. Also, Ghazals and the latest & best of English music is available on Hungama. Though the user-interface is not so straightforward and cluttered design seems quite annoying but automatically downloading songs for offline playing [in Pro Version] is a feature that excites me. Download Hungama: Android, iOS, Windows Phone,. Slacker Radio is another popular name in the list of best music streaming apps worldwide. Though Slacker Radio is mainly popular in the USA and Canada yet, it has got millions of download which justify its quality. Slacker Radio is an online radio station which is also available on mobile devices and multi-platforms. With Slacker Radio, you can get access and listen to a huge collection of music for free from its hundreds of music stations and recommendations. Though various upgraded features are the advantage for premium members yet it is one of the best music streaming app even in free version. Download Slacker Radio: Android, iOS, Windows Phone,. TuneBash is a new entry in the list of best music streaming apps, but it has got enough unique and quality features to change your mood. You can stream and listen to a huge collection of songs, artists, albums, and genre. Search for hashtags (#) is a cool feature that I feel very exciting. For e.g. you can search for #Love to listen to love songs. Using TuneBash, now you can tune into your favorite Indian music as well as international music. The app has also got Social Media integration where you can connect other users socially. Depending upon your activities, it provides you Karma Points which puts you an inch closer to most popular TuneBash users. It is cool online radio service which has got a huge collection of songs, tracks, and albums. TuneIn Radio is one of the best music streaming app which brings various music stations across the globe together at one place. 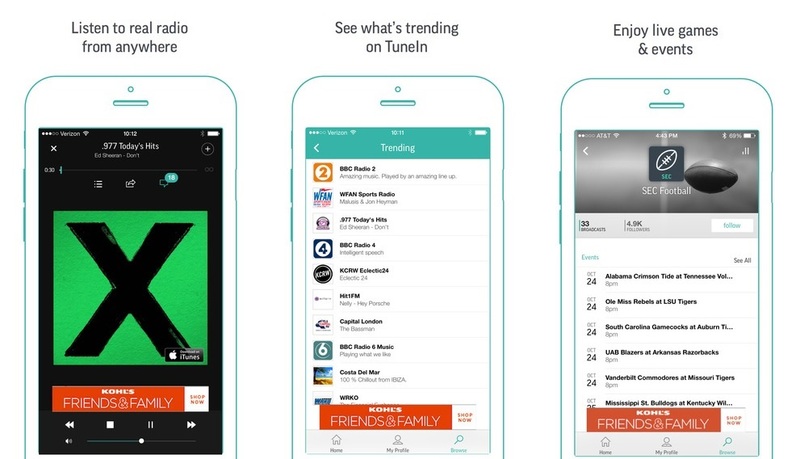 Using TuneIn Radio, you can tune into your favorite music station and not only listen music but also news and other broadcasts from radio broadcast services across the world. For music lovers, TuneIn Radio is a cool place to change their mood by shifting genres across 50+ genres available including sound tracks, jazz, pop, hip-hop, folks, etc. With TuneIn Radio, you are not limited to a particular language or country. That is the reason why it is one of the best music streaming app available now. Download TuneIn Radio: Android, iOS, Windows Phone. Raaga is another popular name in the list of best music streaming apps that I can’t forget to mention here. Being Indian Music lovers, you can stream and listen to music of your choice choosing your preferred language. Not only you can listen to songs in Hindi, Tamil, Telugu and other popular Indian languages but also you can browse through the archive to get tracks based on new releases, popularity, etc. You can also create a playlist to save songs of your collections and share them with your friends. If you are a music lover like me, I’m sure you’ll enjoy its “Raaga Live” feature where you can listen to your favorite songs, albums, artists or genres 24×7. Last but not the least, Sound Cloud is another cool and best music streaming app for music lovers where you can stream and listen to your favorite songs, artists, albums, and genres. Though it has not so huge collection of songs available as compared to other online music streaming services listed above yet it has got some exciting features. However, some of the songs and tracks are uploaded by users, so I have a doubt over their quality of songs as some user might not have uploaded the tracks in their best possible audio quality. 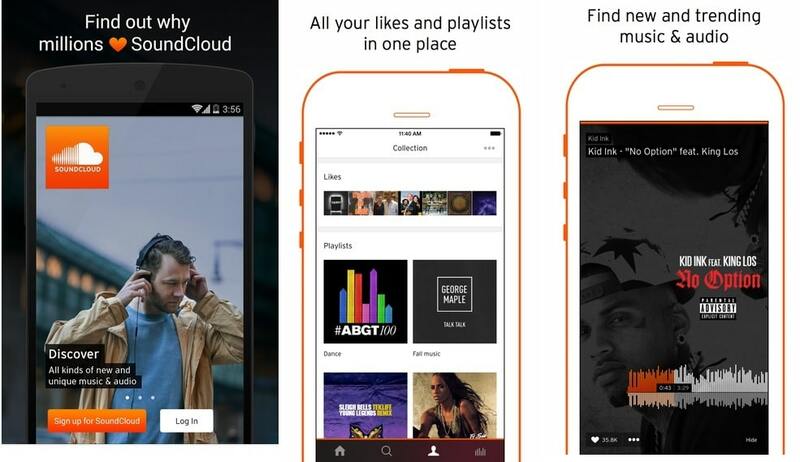 Download Sound Cloud: Android, iOS. Must Read: PERPETUALL Keeps Your Phonebook or Contacts Updated: Free iOS and Android App. 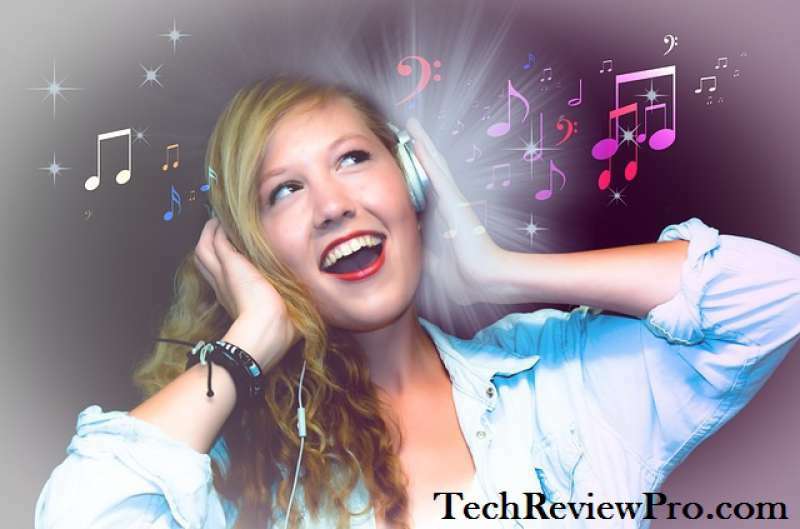 While selecting the best music streaming apps for you, I have omitted some other very popular apps like Deezer, Songza, Google Play Music and iTunes Radio. The reason being, they are available only to a particular operating system and hence can’t be accessed on multi-platforms. Hope you enjoyed reading this post and have got enough idea to select your best music streaming app. By the way, which one is your favorite music streaming apps or services?